1. To pull apart or into pieces by force; rend. It's familiar to me now, so it doesn't catch me off guard. And I've gone through it enough times to know that it's temporary; that once we get back to Tanzania and life resumes to normal, that I will feel okay again. We leave two weeks from tomorrow. It's that season of "lasts" right now. Last visits, last shopping trips, last Taco Bell runs, last times to the park. A season of limbo--that feeling of not belonging anywhere. It's like standing on the precipice between two worlds. It's stressful and anxious and I usually don't sleep very well. Worse: it's the season of good-byes. It feels like ripping a band-aid off of soft skin. Gil said to me last night, "I feel like we come here long enough to realize what we're missing, and then we leave again." There's just no way around it--it's hard. And though the good bye is not forever, now that we have children, it sort of feels that way. Because a year or two can go by in our lives, and not much changes. But a year or two goes by in the life of my children, and everything changes. It's loss, really. Not permanent loss, of course--not as tragic as that. But loss of memories. Family vacations and birthdays and Christmases that won't be spent together. Knowing that even with internet and phone calls and cards, an ocean and two continents separate us. And when we come back, those years can't be bought back. Loss. Of course, I know all those things about why we're going and God's sovereignty and how He brings beauty from ashes. And I believe it. I do not grieve without hope. But the sadness is there. It will remain a lump in my stomach for the next few weeks. It will get better again, I know that. But that doesn't really lessen the pain right now. How I long for that Day to come. That last Day, when there will no longer be any good byes. You are a mega-super-homeschooling mom with years of experience and training. Then you are dropped in the middle of a third world city. You are expected to learn a new language, figure out how to cook, drive, shop, and keep house in an entirely new way. You have no home school co-op. You have no mom’s Bible study at church. Electricity and internet are unreliable. Your children must adjust to making friends with the national children, who speak a different language. In fact, your children often have a hard time finding friends (especially girls) because children as young as 5 and 6 are expected to work and take care of younger children. Sound difficult? We are passionate about the ministry of Haven of Peace Academy. And as we’ve been traveling around, speaking about our passion, sometimes we get the question of why MK schools are so important. In the age of homeschooling, why put so much money and so many people into MK education? It’s a very good question. • Public schools: Consist of 200 children in one classroom. No books, no crayons. Just a teacher with a chalkboard and a switch. • Private schools: Almost always devoutly Muslim or Hindu. All children must comply to religious rituals. Curriculum would not prepare your child for university in the west. • The diplomat school. Very secular, but excellent western-style curriculum. However, minimum cost is $15,000 per year. Imagine raising support for that. So then there is the option of homeschooling. I am a big advocate for homeschooling, and if we were living in the States, we would seriously consider it. But some moms just aren’t gifted for homeschooling (and that doesn’t make them bad moms). But like the picture I painted above, even if you are a homeschooling-mom-extraordinaire, the conditions for homeschooling are significantly harder overseas. Now, indeed there are many missionary families where homeschooling is their only option. But it’s often really, really hard on that mom. Do you see why MK schools are so important? They don’t exist simply because missionaries are picky and want Christian education for their kids. They exist because they are vital to missionaries staying overseas. Vital to allow moms to have the time and energy necessary to learn the language, survive in the culture, and make local friends. Vital to allow MKs to still have enough connection to their home culture that they’ll be able to adjust back to their home country someday. Of course, one of the reasons we chose HOPAC is because of its diversity. We love that there are 30% Tanzanian kids at the school, and another 30% from the business community. We love that there are Hindu and Muslim kids in our classes. But ultimately, we chose it because we believe in the importance of MK education. We believe that if Africa is going to be reached with the gospel, MK schools like HOPAC must exist as well. A Response to "Why Don't You Just Adopt?" I read this article yesterday. It was written by a Christian woman who struggled with whether or not to conceive because she has a genetic bone disorder. She addresses the question that herself and other infertile women have been asked, "Why don't you just adopt?" The tagline states: "The frequent question assumes adoption is both easy and morally superior." In general, I don't oppose the idea of discussing this issue. Asking an infertile woman, "Why don't you just adopt?" is about as insensitive as asking an adoptive mom, "Don't you want 'your own' kids?" Duh. Not on the list of friendly questions. I definitely agree with her when she states that we shouldn't assume adoption is for everyone, because it is not easy. Absolutely. Not everyone has the time, energy, or resources necessary to go through the arduous process (though infertility treatments are not a walk in the park either). I agree that wanting biological children is a God-given desire. And I am not opposed to most forms of infertility treatment. If we were living in the States and our insurance covered it, chances are good that we would be going down that path as well. Not that it would have ever stopped us from adopting. As I've written previously, adoption was never a "Plan B" for us. But what I do bristle against is her insinuation that adoption is often full of ethical problems since many adopted children are not actually orphans. She gives the example of Haitian mothers who are handing their children to foreigners to help them escape poverty. Hmmm. Is this really a reason that someone should consider not adopting? Should families refuse to adopt from Haiti or any other developing country because poverty has forced these mothers to give up their children? First of all, speaking as someone who has gone through two international adoptions, let me assure you that if you do it the right way, there are multiple safeguards in place to ensure that children being adopted have not ever been forcibly taken from crying birth mothers. If you think about it, most adoptees, even in the United States, are not true orphans. Almost every adopted child has a biological parent out there somewhere. Does that mean that they shouldn't be adopted? Of course our goal should be to help reduce the poverty that leads to fractured families. Of course it is a tragedy when a birth mother feels she cannot raise her child, for whatever reason. Of course it is a good thing for a child to know and love the culture which he or she came from. But if we doubt that it could ever be in the best interest of a child to be removed from their biological family and put into a new one, then how could we ever become a part of the family of God? If we doubt our ability to love an adopted child, how can we know with assurance that God loved us as His adopted children? If we doubt the wisdom of mixing the races in our family, how can we say we believe that we are all brothers and sisters in Christ? God hasn't led us down that path (yet! ), so He does not lead every family to adopt. But please, please, don't use the wrong reasons to make a decision not to adopt. Don't tell me that poverty alleviation is the only answer to children in poverty. Don't use the excuse that adoption shouldn't be necessary. Don't tell me that it's better to let a child languish in an orphanage with the hope that "someday" his parents will be able to take him home, instead of putting him in a loving home right now. Yes, let's work on poverty alleviation. Yes, let's work on helping well-off Haitians (or Tanzanians, or Romanians, or whatever) to consider adoption for their own families. Yes, let's remember that we Americans are not the "savior" for these countries or their children. But as followers of Christ, let's also do everything we can to rescue these children from a life of desperation. The author of this article states that she is not against adoption. But if she questions the morality of adoption, then how can she be for it? Indeed, we must be on our guard against any kind of insidious child-trafficking. But let us not take our eyes off the knowledge that adoption was created by God and is one of His passions. Note added in 2016: My views on this issue have changed. Please start here to read what I have discovered. To my children, there are no strangers. We have visited dozens of homes and churches and people in the last 4 months. And of course, everyone already knows who they are. Everyone is a friend. Both Grace and Josiah will now hug and kiss anyone on command. In fact, they will do so even not on command. When they are leaving a home, they automatically hug and kiss everyone in the room. They've figured out that's just what you do. This does have some ill effects. At the park one day, Grace asked a total stranger to push her on the swings. At Disneyland last week, my kids socialized with everyone around them. ("My name is Grace; What's your name?") I'm kind of surprised they didn't start hugging and kissing them as well. They've loved it. Quite often when they pray, they thank God for their new friends. If you are considering adoption or have adopted or are adopted, read this book. If you have a family member or friend who is adopting and you want to know how to help them, read this book. If you are a believer who wants to better understand your identity in Christ, read this book. I've read numerous books on adoption over the years, and this is by far the best. 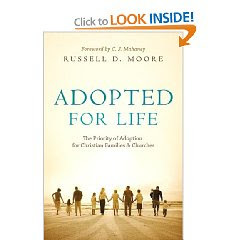 Author Russell Moore starts with our adoption as believers into the family of God. His descriptions are beautiful and powerful and life-changing. Though I don't agree with every single statement he makes, I still highly recommend this book. "In this book I want to call us all to consider how encouraging adoption--whether we adopt or whether we help others adopt--can help us peer into the ancient mystery of our faith in Christ and can help us restore the fracturing unity and the atrophied mission of our congregations." "Sometimes people will speak of children who've been adopted as prone to having an 'identity crisis' at some point in their lives....this kind of crisis of identity isn't limited to children who've been adopted. All of us are looking to discover who we really are, whether we were born into loving homes or abandoned at orphanage doors, whether we were born into stable families or born, like our Lord, in a stable." "Imagine for a moment that you're adopting a child. As you meet with the social worker in the last stage of the process, you're told that this twelve-year-old has been in and out of psychotherapy since he was three. He persists in burning things and attempting repeatedly to skin kittens alive. He 'acts out sexually,' the social worker says, although she doesn't really fill you in on what that means. She continues with a little family history. This boy's father, grandfather, great-grandfather, and great-great-grandfather all had histories of violence, ranging from spousal abuse to serial murder....Think for a minute. Would you want this child? Well, he's you. And he's me. That's what the gospel is telling us. Our birth father has fangs. And left to ourselves, we'll show ourselves to be as serpentine as he is." "Adoption would become a priority in our churches if our churches themselves saw our brotherhood and sisterhood in the church itself rather than in our fleshly identities." "The whole universe is now an orphanage." "We don't believe that our new Father will feed us, so we hang on to our scraps and long for the regimented schedules of the orphanage from which we've come." "The real struggle for me shouldn't be the occasional rude question about my son's identity; it should be the ongoing question about my own." "Imagine if Christian churches were known as the places where unwanted babies become beloved children." "The contemporary Planned Parenthood movement was started by a woman named Margaret Sanger, who defended abortion rights on the basis of eugenics, the search for 'good genes' based on the racist and evolutionary notions of 'social Darwinism' prevalent in her day. Sanger's grandson, Alexander, continues her viewpoint, updated with contemporary notions of sociobiology, in virulent opposition to the viability of an adoption culture--on Darwinist grounds. 'Adoption is counter-intuitive from an evolutionary vantage point of both the biological mother and the adoptive parents,' Sanger argues. 'Adoption requires a person to devote time and resources to raising a child that is not genetically related. Adoption puts the future of a child in the control of a stranger.' It's easier for a woman to have an abortion, Sanger argues, or for a family to refuse to think about adopting because evolution and biology 'conspire to thwart adoption. Evolution has programmed women to be nurturers of the children they bear.' That why, the abortion industry heir contends, adoption 'as the solution to the abortion problem is a cruel hoax.'" "What better opportunity for you to model the God who adopts from every tongue, tribe, nation, and language and sets all the children together at the same table with the same inheritance and and the same love?" I love being home. I love seeing my family all the time; I love seeing my kids interact with their grandparents. I love being with an amazing church family and so many friends. I love all the options in grocery stores. I love not feeling sweaty all the time. I love being able to sleep at night without fear of armed robbery. We’ve done a lot of traveling these past few months; all over California. We’ve visited so many homes in many cities. And there are times I feel the pull of this life. Wouldn’t it be nice to live closer to family? Wouldn’t it be nice to live in a small town in the California mountains? Or downtown in a big city? To have my own house? To be able to attend a Bible study for moms? It does attract me. Long ago, in college, I couldn’t fathom the idea of living in the States. But now that I am married and have kids and have spent a number of years trying to figure out how to live in a third world country, I must say that this life lures me. A couple of weeks ago, as we were on a long drive through the beautiful Northern California mountains, I asked God, “Don’t you want to call us here?” But nope. No call. Not even a smidgen. I couldn’t think of a single reason why God would want us to live there. It was kind of disappointing. So, I am packing my bags. I am dreading leaving, but I am not dreading going back. Times like this are good, because they make me evaluate and re-evaluate why we are doing what we are doing. Why we would go halfway across the world away from our families and only get to see them every couple of years. Why we would purposely choose a low salary (by American standards only) and be willing to deal with electricity problems and heat and mosquitoes and a culture that we do not understand. Because it is a perfect fit for us. Because there is a need that we can perfectly fill. And that makes us called. That this life is not all there is. Heaven is yet to come. That joy comes through sacrifice. That by losing my life I will save it.